Prison officers at the Adelaide Remand Centre walked off the job yesterday to protest at the State Liberal government’s plans to privatise the facility. Under capitalism, prisons are part of the coercive apparatus of the state, yet as employees and union members, warders are entitled to fight for wage increases and better working conditions. Even more so, when the issue at hand is a political one (the threat of privatisation), rather than a purely economist one (wages and conditions), then they should be supported. The walk-out arose from measures announced in State Treasurer Rob Lucas’ first Budget. Along with the Remand Centre’s privatisation, the government announced the closure of seven TAFE campuses (including three in remote locations), increased rents for Housing Trust tenants in bedsit and one bedroom cottage flats, saving $70 million by abandoning the previous Labor government’s plan to provide laptops to every Year 10 student, cuts to some public transport service and closure of three Service SA (motor registration) Centres and cuts to FTE staff in the education and environment departments. There was visible anger during the march and rally at new Premier Steven Marshall who had told a Public Service Association delegates’ meeting last February (ie just before the state election) that he had “no privatisation agenda”. The prison officers tried to outdo each other in shouting “Marshall…liar! Marshal…liar!” throughout the march and rally. 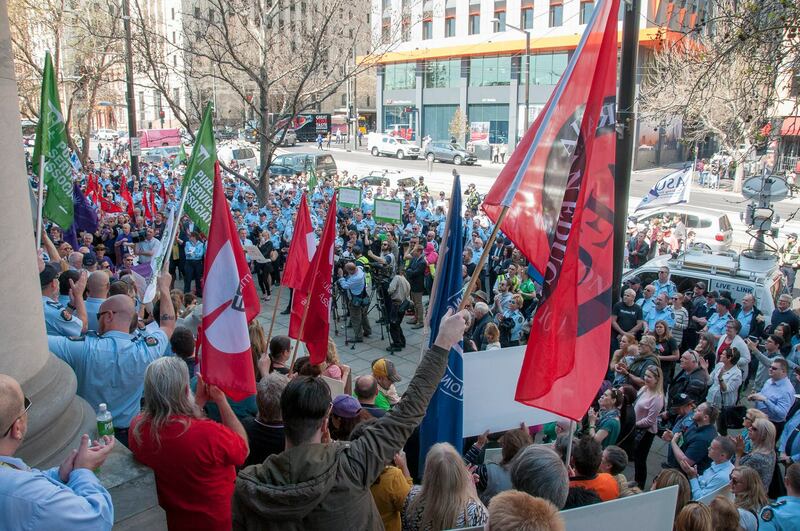 Although there were some state Labor MPs scattered through the 1500-strong participants at the rally, they could not have been all that pleased when PSA Secretary Nev Kitchen remarked that the anti-privatisation struggle was not party political. Everyone knows that Labor had its own privatisation agenda while in office, selling off the Land Titles Office and the Motor Accident Corporation in its last term of office. It sold Land Titles to Land Services SA — a consortium of Macquarie Infrastructure and Real Assets and the Public Sector Pension Investment Board. Labor has built new schools and the new Royal Adelaide Hospital as Public Private Partnerships - the private sector owns the hospital and provides all its hotel (food, linen etc) services. It had placed TAFE under the control of the big end of town as a statutory authority. Business SA CEO Peter Vaughan, a public opponent of TAFE became the foundation Chairman of its Board. And Labor renewed the contract for the private operation of the Mt Gambier prison, operated by notorious British multinational G4S. The PSA and other SA unions have a huge battle to beat back the government’s privatisation agenda. Rob Lucas was the architect of the privatisation of the Electricity Trust of SA (ETSA) in 1997-8. The Liberals had gone to an election claiming that “We are not pursuing a privatisation course with ETSA.” It was a disaster, with electricity prices going through the roof. Lucas is simply a privatisation ideologue and has been bruising for a fight with unions and the community over the issue. There can be no course other than unity with and support for the prison officers. Studies show no evidentiary basis for private prisons. A 2016 study by the Business School of the University of Sydney found that: “Australia now imprisons more people than at any point in its history. “Private prisons now incarcerate 18.5% of the prison population of Australia (Productivity Commission, 2014: Table 8A.1), and clearly play a large part in the functioning of the custodial system in Australia. In fact, Australia has the highest rate of private incarceration per capita of any country in the world (Mason, 2013: 2). Our future lies in the defence of the rights of all. Unions and the community must close ranks and set aside differences while there is an opportunity for united action around an anti-privatisation agenda.